The Kappa - 7 was one of Japan's early sounding rockets and was designed as a booster for Japan's later Kappa - 8 and Kappa - 9 rockets as well as being used as a single - stage rocket. It was determined, however, that the vehicle was unsuitable as a single - stage rocket and the lone Kappa - 7 flight was made on November 18, 1959 to confirm the motors suitability as a booster. 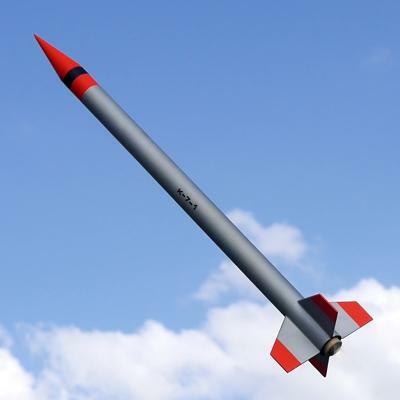 This scale model of the Kappa - 7 makes a great beginners kit and a fun rocket for modelers of any experience level! Laser-cut basswood fins, balsa nose cone, quick-change engine hook and water-slide decal make this kit easy to build and fly. Capable of flying on a wide range of engines, this great looking (and flying!) model can be flown on practically any size field! Kit has been recently updated and the instructions have been re-written. Adhesive (A wood glue, such as Elmer's Carpenters Glue or Titebond can be used throughout and is recommended. Other adhesives, such as epoxy or cyanoacrylate can be used if you are familiar with their use); hobby knife with a sharp #11 blade; straight edge (preferably metal); scissors; masking tape; sanding sealer (or balsa fillercoat); thinner (appropriate type for the sanding sealer); small paint brush; paint (Spray paint, such as Krylon or Testors is recommended. Be sure not to mix different types or brands of paint without testing. ) - primer (optional), white, aluminum (or silver), fluorescent red & flat clear (optional); sandpaper (medium - 220 or 280, fine - 320 or 400, & [optionally] extra fine - 500 or 600); ball point pen; pencil.